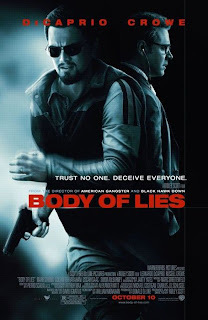 Ridley Scott's latest work, Body of Lies, stars Leonardo DiCaprio as Roger Ferris and Russell Crowe as Ed Hoffman. This movie makes a case battling terrorism effectively. American bureaucrats are too proud to stop and learn an effective method to battle terrorism, therefore America is losing the War on Terror. Ask anyone besides the U.S. government and they will tell you that the "War on Terror" is not going well (for either side). Ever since America declared this war in response to 9-11, terrorist activity has been on the rise. In case you thought eight years of bombing and invasions would discourage terrorism, you thought wrong. It makes sense that military invasion would conflagrate terrorism because terrorism is fueled by religious zeal. Invading and then occupying middle-eastern countries for years on end against the will of those countries legitimizes the terrorists' cause, thus inspiring and more people to join their ranks. I'm not against resisting terrorism nor am I against just wars. But trying to resist religious zealotry with military force is like trying to make peace with an already angry man by pointing a gun at his family. So here's how the War on Terror relates to God's kingdom: Jesus Christ already showed us how to fight terrorism. The driving force behind terrorism and all conflict in general is a lack of reconciliation. The fact that people are unreconciled to themselves, to the world, and (most of all) to God has been causing problems since the dawn of humanity. Enter Jesus. His secret weapon for disarming the most ruthless, militant, violent aggressors is to take their anger, hurt and rage upon Himself. This is mercy. Christ's truthful words offended people, so they killed him. He didn't deserve to die, but he died anyway because God sent him for this purpose. By dying for other people, even on a cross, even for people who hated him, Christ gave us the perfect method for battling terrorism. This doesn't translate very well into government policy but, then again, it was never meant to. God transforms people's lives one at a time, from one heart to another, from the ground up. This is a relational strategy, not a political policy. On another practical note, Body of Lies should remind us Americans to be careful about the way we as a nation define and react to terrorism. Let's keep in mind that this country was established through a collective act of terrorism against the British government. Both Americans and the whole world would benefit from a more humble, U.S. foreign policy. Human life, regardless of nationality, race or religious inclination, is too valuable to be wasted on military-hotheadedness. I think Crowe embodied that American "hotheadness" perfectly...I just hope that there isn't an Ed Hoffman sitting in Washington pulling the strings like that and just eating himself and our country to death! The Hoffman character was well-written I thought. Brash, but charming. Out of touch, but with generally good intentions. I would have liked to see more of a direct conflict between him and Ferris play out.